Mark Twain started it when he said, “Write what you know.” From then on, writers have taken that as gospel. Dig deep. Scratch out what you feel/think/are passionate about and bleed it onto the page. As new writers it’s one of three truths pounded into us–Show don’t tell, Murder your babies, and Write what you know. No one ever asks, “Don’t novelists make stuff up?” It doesn’t seem to matter than no one’s ever seen DC blow up though thriller writers postulate it all the time. How about a massive gorilla atop the Empire State Building? Fantasy writers make up whole worlds and species. As do Sci Fi aficionados. Did they not get the memo? What about Hannibal Lector, cutting people’s heads open to eat their living brain? Or Criminal Minds‘ psycho killers? I’d rather drink Drano than think they’re real. In a rational literary world, making stuff up makes sense. It’s called ‘fiction’, which Webster defines as ‘not real’ (I’ve abbreviated, but you get the idea). How does that jive with ‘Write what you know’. 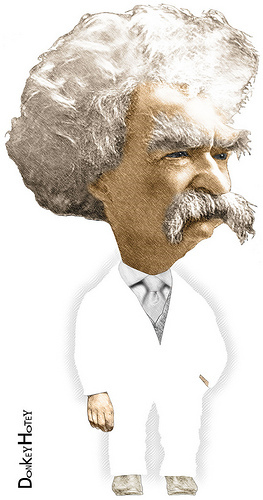 What Mark Twain should have said–maybe meant to say–was ‘Lie creatively. Do your research, weave with zest, be believable, and write’. But that’s got all the literary charisma of a dirty needle. Maybe he meant it as a suggestion, Write what you know. Or not. Your choice. I confess, I tried to ‘write what I know’. I imagined what people I knew would do in particular circumstances and wrote that story. It was boring. Then, I researched a topic, got all the details exquisitely perfect and then added fiction characteristics like characters, setting, crises, pacing–stuff like that. It was creative nonfiction before that was invented. I figured I was still ‘writing what I knew’, just embellishing. No one bought it. I actually loved it, but not so much I didn’t recognize that it had no power, passion, or pull. That’s when the truth hit me: Great authors don’t write what they know. They write what they wish they knew or should know. Maybe they include their politics or morals or some other closely-held opinions, like sauce on an over-cooked chicken, but the rest is fiction. Today, twenty years and counting into my writing fantasy, I’m ready to admit I’ve been duped. If you. like me. have seen the truth, I invite you to a virtual Write-What-You-Know Writers Anonymous meeting. Add your name to the Comment section below. I’ll start. Hi. My name is Jacqui, and I’m a recovering WWYKW. Since my epiphany, I’ve written ten thousand eight hundred and seventy words that have no basis in my life, history, or reality. This entry was posted in Jacqui Murray and tagged writing. Bookmark the permalink. If I wrote what I know… I’d only write about budgeting and financial reporting software, coffee and the importance of homegrown vegetables in one’s diet. Hmm. I do write about coffee a lot. Maybe I do need to add my name to the list. Sounds interesting to me. A budget gone wild–there’s a thriller. Financial mis-reporting–a mystery! I think the ‘Write What You Know’ topic is more about theme than characters and setting. I wrote a book about teens in the 1920s, something I had to research a lot. But the theme of my book was making your own decisions and growing up, something I’m very familiar with. If you’re passionate about what you’re writing, I think it shows through because you ‘know’ that topic, it’s something you can feel. Even if you have to research the details, you can still know it. I have always thought so too, Sam, until I did some research preparing for this article. I wanted to see what the overarching ‘take’ was on this topic–and was surprised people often take it literally. I think that’s why there are so many literary fiction writers–we know our own emotions, thoughts, worries much better than history, mystery, and how to end the world. I’m paraphrasing of course, but it was one of the best bits of advice I’ve read so far and matches perfectly with what you’re saying. That’s a great way to say it. I’ll have to look him up. I’d have trouble with that one, too, but it’s done all the time. As is the reverse. How far along are you? I have the outline finished. I have to put in the scenes. I have certain parts finished as they were assignments given in class. Because my protagonist is a man I’m afraid to do 1st person so I’m thinking maybe 3rd person limited? What do u think? 1st person is more intimate, but that’s probably not preferable for your first cross-gender novel. I like 3rd person. It allows closeness, but is more flexible. Is this character-driven or plot-driven? I think it’s more plot driven. Although I just finished reading Donna Tartt, The Secret History, and I have to say I loved her writing style. I still think about those characters even after I finished the book. Did you read it? It’s amazing and has so altered the way I look at writing characters. Thanks for taking the time to help me. I really appreciate it! I didn’t read it, but it’s on my list now. I love finding books people are over-the-top excited about. Thanks for the rec! Sure, I loved it. Now I waiting for her latest book, The Goldfinch. I want to make my characters memorable even though the plot centers around a women who was abused by her mother and my protagonist was in the foster care system. I still want to make my characters stand out the way Donna did. I’m pretty sure she wrote it from the 1st person viewpoint. It a big goal but what the heck right? A really interesting post, thank you. I write what I know on my blog – as a domestic abuse survivor I’m passionate about the subject – but I want to set my (possibly never to be completed) book in a country to which I’ve never visited. Am I crazy?! Maybe sci-fi writers have it ‘easier’, because if they invent the species and characters, nobody can tell them they’ve got the facts wrong! You have that experience that should be told. So many people can benefit from your experience. Setting can be nicely learned these days with Google Earth. Just type in the international address and drop in on the neighborhood with Street View Guy. I’ve been amazed what I learn that way. If we accept the title, we can do the job. You and me, Melissa–we’re going to start this thing! Absolutely – where do I sign up! It does. I started valiantly sticking to what I knew which got me through a couple of chapters. Then Imagination kicked in. Writing about stuff was a lot more fun than figuring out how to do it in realtime (ride a submarine, be a grad student at Columbia, roam the African savannah–don’t those sound cool?). Im afraid Im a fabrication mostly in my fantasy novels. I write about the places and creatures I wish I could meet Jacqui. It people like you that really got me thinking. Fantasy writers have to write what they don’t know–so what’s wrong with that? Turns out, I’m late to the party on this one.